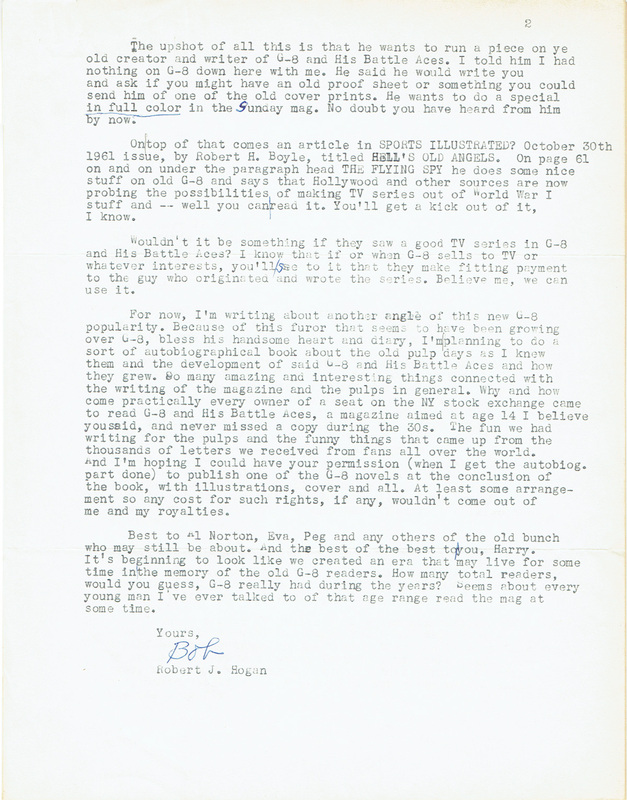 A few years ago, writer and frequent Age of Aces contributer Don Hutchison came up to our table at PulpFest and handed us a manilla envelope, entrusting us with its contents. 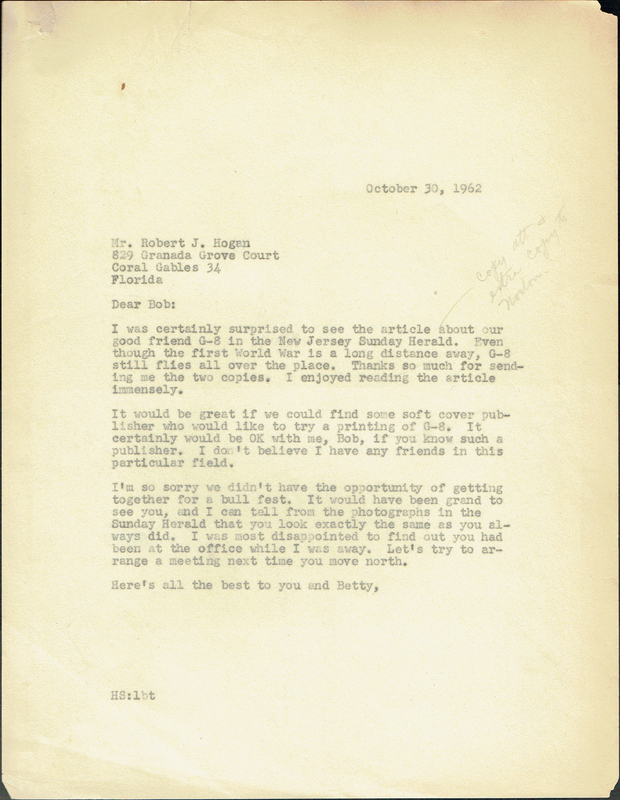 When we opened the envelope, there were correspondence between Robert Hogan and Henry Steeger and a copy of the Newton, New Jersey Sunday Herald from October 21st, 1962. 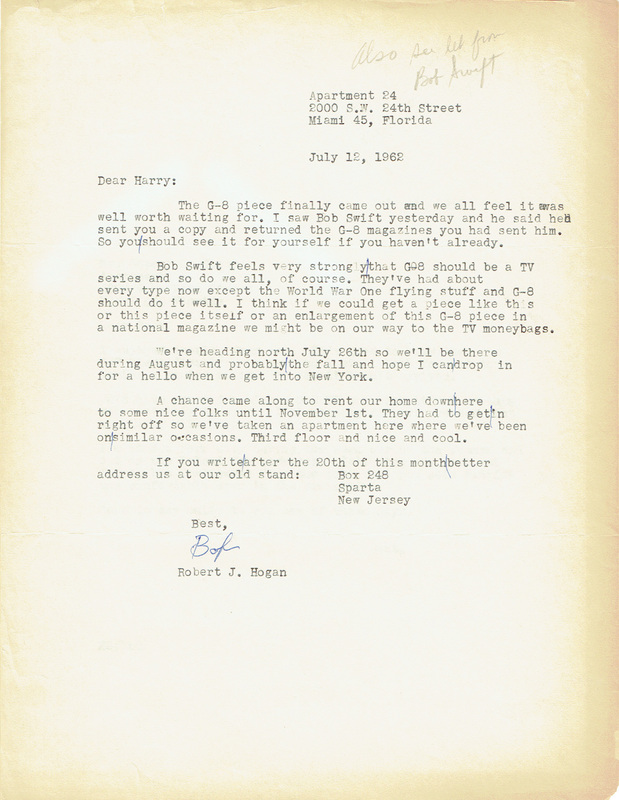 While we don’t have a copy of Bob Swift’s G-8 homage that ran in the Miami Herald Sunday Magazine on July 8th, 1962, we do have an article on Robert J. Hogan that ran in his local paper, the Newton, NJ Sunday Herald in October of 1962. We posted the article—“Lurid Plots Hatched In Sussex Boro”—back in October. 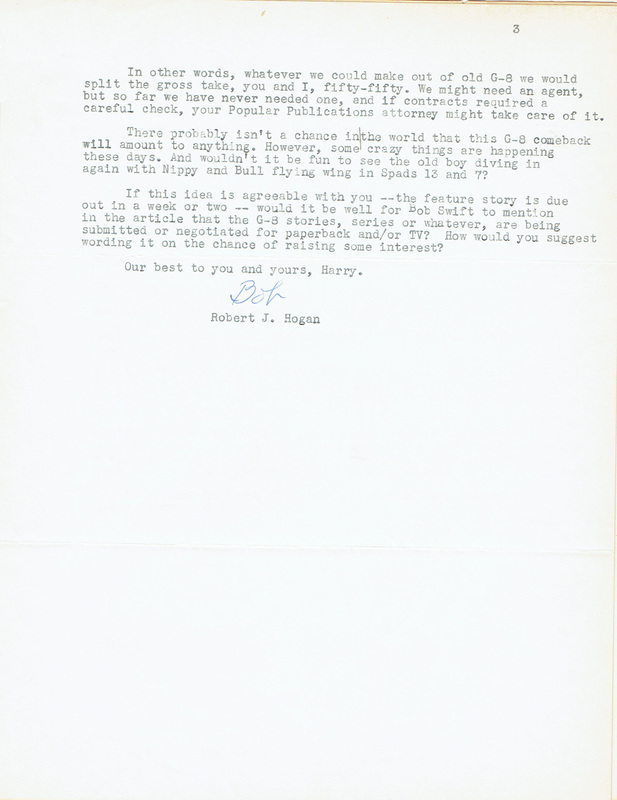 What follows is the correspondence between Robert J. Hogan and Henry Steeger in regard to this article. . . Seemed to us the editors did a specially fine job on the local story of G-8. See pages 6 and 7 of our little Sunday Section inclosed. I’m sending a couple of copies in case you might want to send one around to agencies or whatever. If you should want more of this or the Sunday Magazine of the July 8th Miami Herald let me know and I’ll get you more. Seems as if we might interest some soft cover publisher into trying one printing of a G-8. We could offer it with no cost to him and the use of the cover painting for the cover of the book. We could take our royalties later, if any, so the soft cover publisher wouldn’t be losing any advance money that the first try didn’t earn. If we were going to be north longer I’d take these two G-8 writeups and see what I could do canvassing the various soft cover markets. But we’re starting south in a few days. Betty’s father is worse and we want to get down nearby where we can help out. Since we’ll be on the move by the time you receive this, I’m giving you the address of the Hogan shanty in Coral Gables. Sorry we didn’t get together while we were north, but maybe next time, let’s hope. I was certainly surprised to see the article about our good friend G-8 in the New Jersey Sunday Herald. Even though the first World War is a long distance away, G-8 still flies all over the place. Thanks so much for sending me the two copies. I enjoyed reading the article immensely. It would be great if we could find some soft cover publisher who would like to try a printing of G-8. 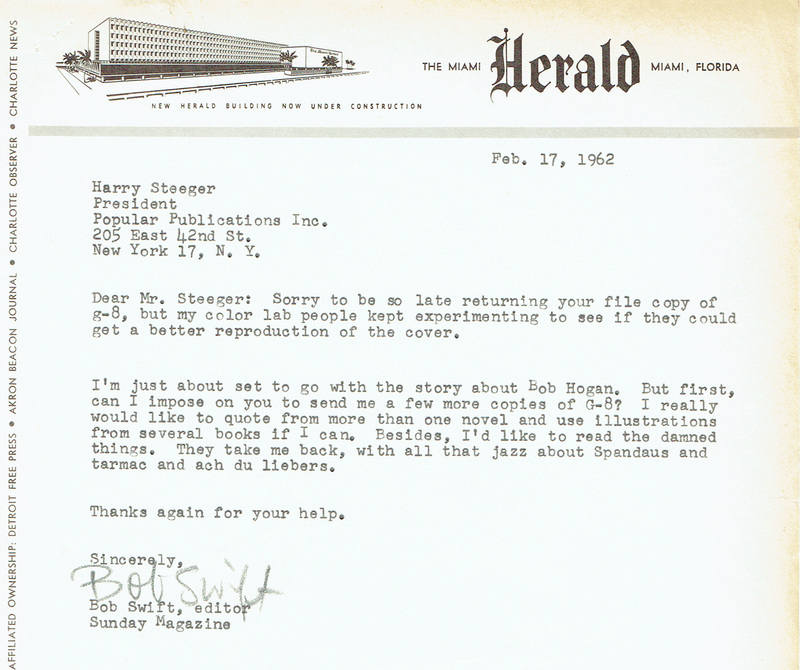 It certainly would be OK with me, Bob, if you know such a publisher. I don’t believe I have any friends in this particular field. been at the office while I was away. Let’s try to arrange a meeting next time you move north. 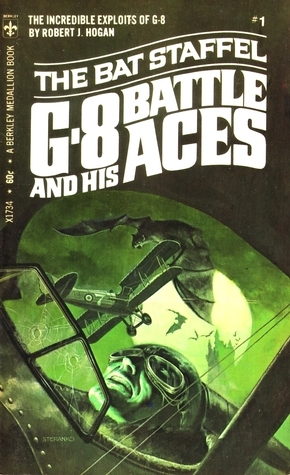 Berkely Medalion would eventually publish a series of 8 G-8 and His Battle Aces unabridged paperbacks from 1969 through 1971—the first three with new cover art by Jim Steranko. 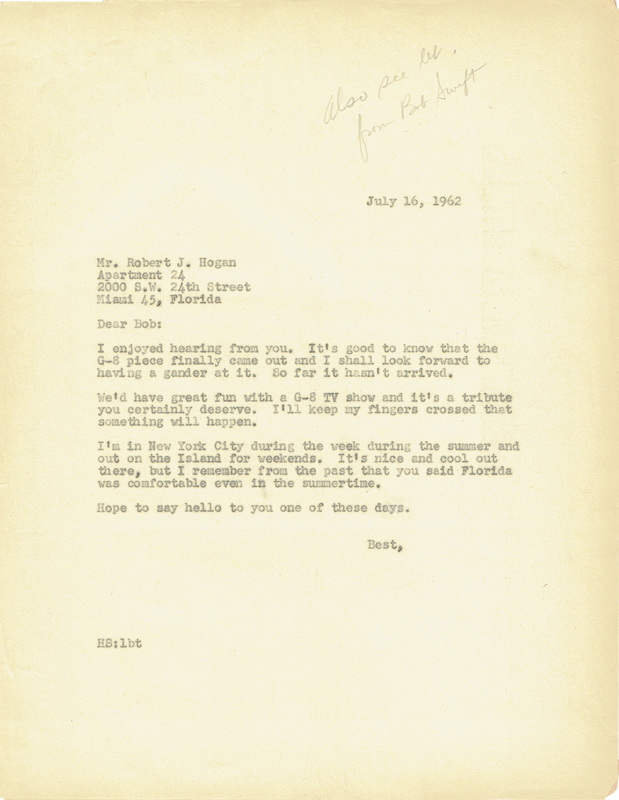 The correspondence continues but this time with a series of memorandums between Henry Steeger and Bob Swift, editor of the Miami Herald Sunday Magazine, as he prepares to publish the article on Robert J. Hogan and G-8 and his Battle Aces. . . Sorry to be so late returning your file copy of g-8, but my color lab people kept experimenting to see if they could get a better reproduction of the cover. I’m just about set to go with the story about B0b Hogan. But first, can I impose on you to send me a few more copies of G-8? I really would like to quote from more than one novel and use illustrations from several books if I can. Besides, I’d like to read the damned things. 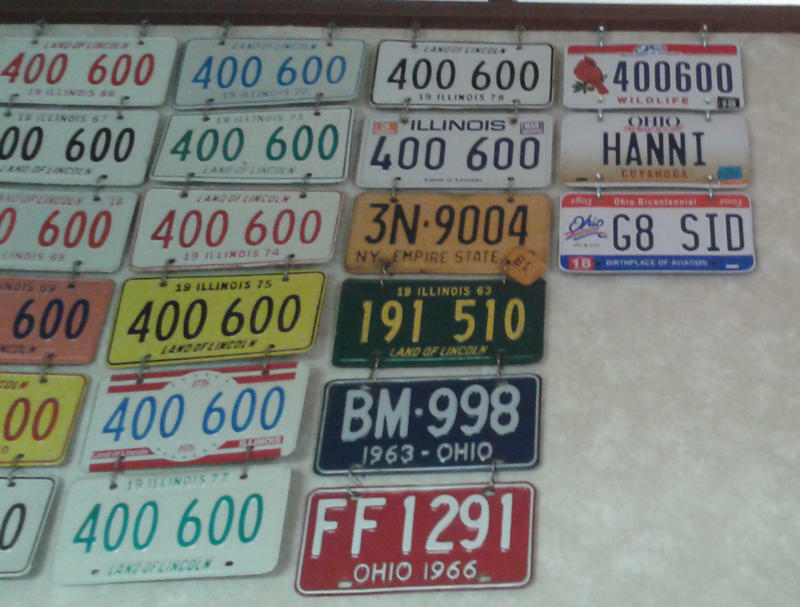 They take me back, with all that jazz about Spandaus and tarmac and ach du liebers. I got quite a kick out of going through that copy of G-8 myself. I’ll try to dig up a few mora for you and shoot them along. 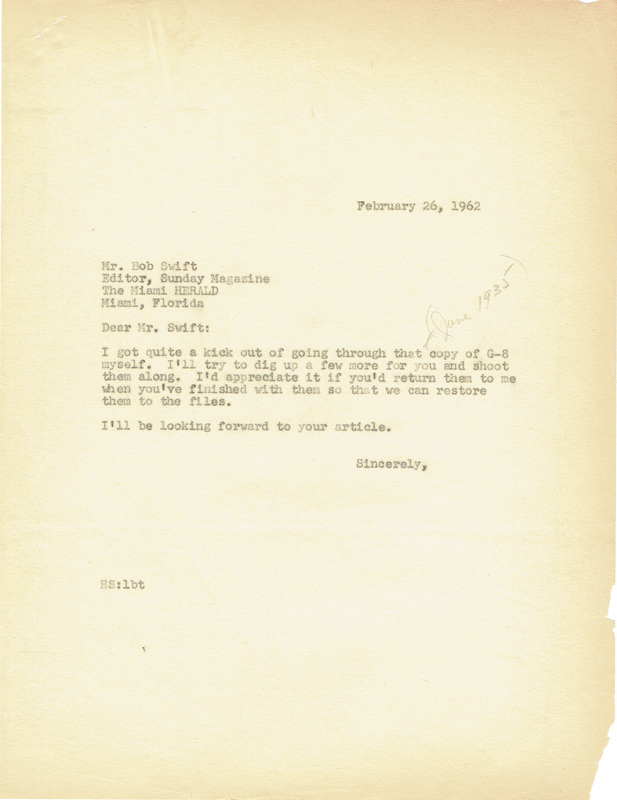 I’d appreciate it if you’d return them to me when you’ve finished with them so that we can restore them to the files. I’ll be looking forward to your article. Thanks for returning the June 1935 issue of G-8 AHD HIS BATTLE ACES. We’ve dug up three more issues – October, November and December 1936 – and these are enclosed, You can shoot them back when you’ve finished with them. Here are your copies of G-8, and I must say I return them with great regret. There’s a great deal of nostalgia about the pulps and I mourn their passing, as you may gather from my story about Bob Hogan and G-8. The response to the story has been gratifying, with a great deal of comment from balding, bespectacled guys in their 30’s and early 40’s. Most of that comment concerns the nostalgia they felt for the old days in the small towns, journeying to drug store or news stand for G-8 and all the other pulps, the whole flavor of being 10 or 14 or so during that era. Actually, I cheated a little. I was only four years old when G-8 first appeared and didn’t actually pick up on him until about 1939 or 1940. But I made up for it by buying all the old copies I could find in the second hand book stores. Anyway, thanks for your help and patience. By the way, if you’d like to run a story about Hogan and G-8 in one of your present books I’d like the assignment. Perhaps a similar story? The correspondence continues . . . It was so nice to heer the enthusiastic agreement with our 50-50 idea on good old G-8. We’re working on it. Betty came up with an idea a while ago. She said it seemed that Walt Disney would be the only outfit on the coast or anywhere to do justice to G-8 if he came back for movies and/or TV. Betty always was the brains of our family and that proves it. Of course, Disney, when the time is right. I believe this is something that needs care and good, Efceajiy buildup (if we live so long) if we can get the idea off the ground at all. But strange things happen. Sax Rohmer’s brother-in-law is a friend of ours down here. Bill said some outfit paid Sax $4,000,000 for all rights to Fu Manchu not long before his death and the old Chinaman had been outmoded and outdated for many years. TV is a hungry monster and no telling which ways the giant jaws may snap. Certainly not our way, likely, but it’s just as well to be prepared. I liked the way Erle Gardner handled Perry Mason for TV. Of course we haven’t got a Perry Mason but the approach (and it does seem we do have a sizeable ready-made audience), seems to me, should be the same, slowly and carefully until we get things right. I could use a little or a lot of money myself at this or any time (who couldn’t) but not to the extent that we have to make a quick sale at sacrifice to a well done product. Last night I watched the rehash of the 1946 spy movie 13 Rue Madeleine on our TV. The review said it was GOOD. I decided after watching it that some of the old G-8s could show Madelein some real suspense. Kind of got me itching to get things going. Anyway, we’ll see. I’m writing mainly to say thanks and to give you our new temperary address. Don’t feel you must answer this, but any ideas are always welcome. We’ve rented out Coral Gables shanty till April 10th to some nice folks (we hope) from Darien, Conn. So we’re very comfortable near Betty’s folks In a one bedroom apartment where we’ve spent two winters before this, secomd floor overlooking a lovely garden, coconut palms, avacado and grapefruit trees outside the window and such. And right now it’s in the mid 70s. How about you and Shirley coming on down? We’ve got the big, old Chrysler to get around in. Bob Swift of the Herald Sunday Magazine said last time I talked to him that the photo lab hasn’t brought down your G-8 mad yet. Soon as they do he’ll return it to you. Meantime, he’s slated the article for Sunday magazine early in March. Let’s all Keep our fingers crossed that G-8 hits the TV screens! It was good to hear from you again – and let’s hope a sale is made. I agree with you that G-8 could show many of these programs some real suspense. Be sure to send me a copy of the Herald Sunday Magazine when G-8 makes his bow early in March. Wish we could get down to see you, but Shirl and the kids and I usually go north to ski during the winter time. Your set-up sounds terrific and I can lmaglne life must really be pleasant in your Florida home. The Miami Herald Sunday Magazine feature on Robert J. Hogan and G-8 and his Battle Aces would not see print until July of 1962. 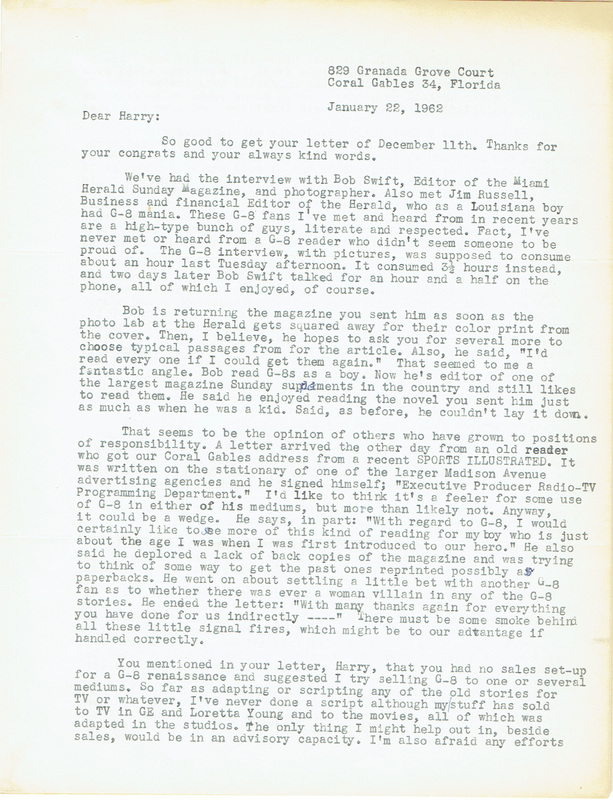 Our correspondence picks up next week with notes between Bob Swift and Henry Steeger. 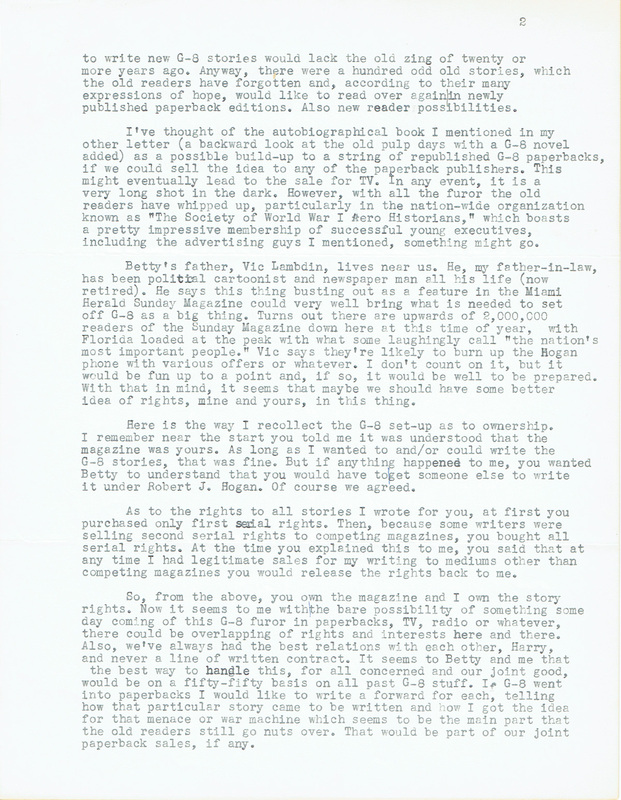 Responding to Steeger’s letter of the 11th, Hogan fills Steeger in on the interview with Bob Swift for the Miami Herald Sunday Magazine and talk of the rights structure to the G-8 stories and the possibility of a G-8 television show. . . So good to get your letter of December 11th. Thanks for your congrats and your always kind words. 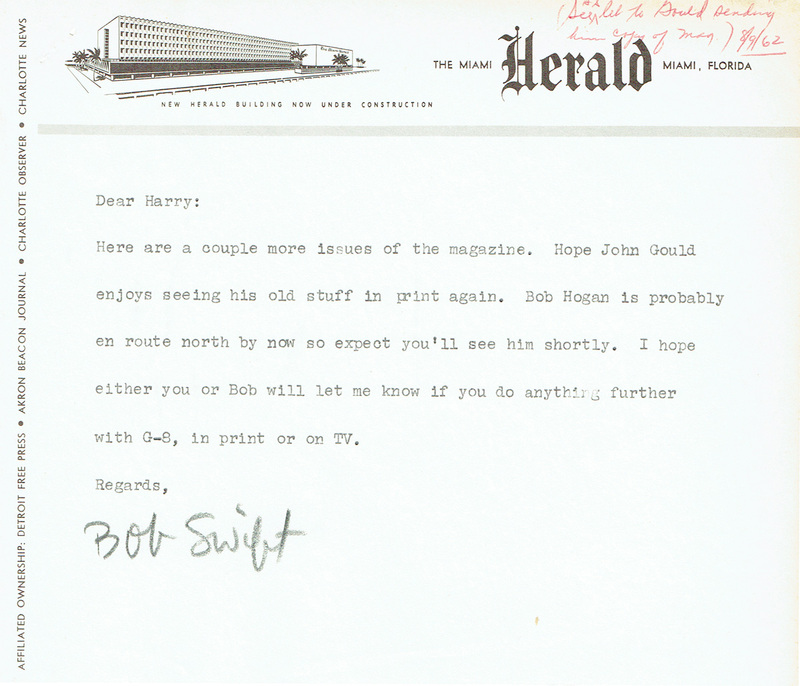 We’ve had the interview with Bob Swift, Editor of the Miami Herald Sunday Magazine, and photographer. Also met Jim Eussell, Business and financial Editor of the Herald, who as a Louisiana boy had G-8 mania. These G-8 fans I’ve met and heard from in recent years are a high-type bunch of guys, literate and respected. Fact, I’ve never met or heard from a G-8 reader who didn’t seem someone to be proud of. The G-8 interview, with pictures, was supposed to consume about an hour last Tuesday afternoon. It consumed 3½ hours Instead, and two days later Bob Swift talked for an hour and a half on the phone, all of which I enjoyed, of course. Bob is returning the magazine you sent him as soon as the photo lab at the Herald gets squared away for their color print from the cover. Then, I believe, he hopes to ask you for several more to choose typical passages from for the article. Also, he said, “I’d read every one if I could get them again.” That seemed to me a fantastic angle. Bob read G-8s as a boy. Now he’s editor of one of the largest magazine Sunday supplements in the country and still likes to read them. He said he enjoyed reading the novel you sent him just as much as when he was a kid. Said, as before, he couldn’t lay it down. That seems to be the opinion of others who have grown to positions of responsibility. 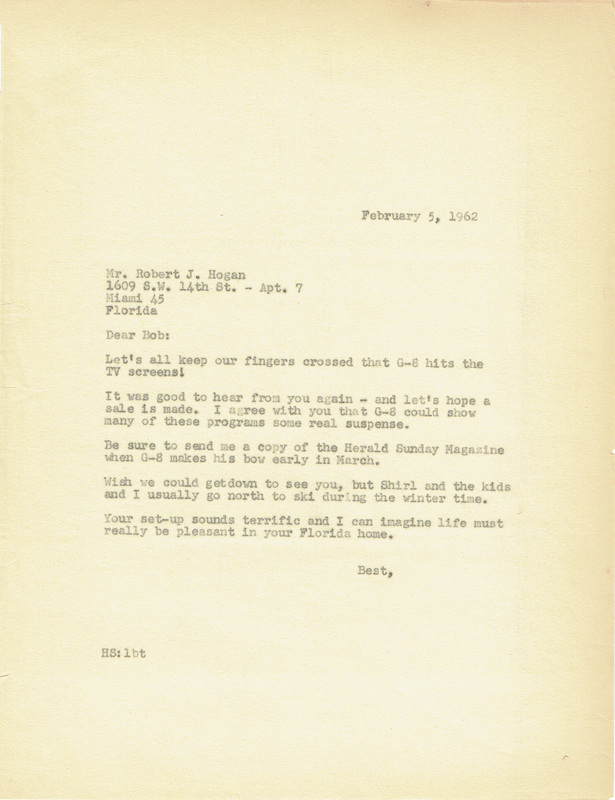 A letter arrived the other day from an old reader who got our Coral Gables address from a recent SPORTS ILLUSTRATED. It was written on the stationary of one of the larger Madison Avenue advertising agencies and he signed himself; “Executive Producer Radio-TV Programming Department.” I’d like to think it’s a feeler for some use of G-8 in either of his mediums, but more than likely not. Anyway, it could be a wedge. He says, in part: “With regard to G-8, I would certainly like to see more of this kind of reading for my boy who is just about the age I was when I was first Introduced to our hero.” He also said he deplored a lack of back copies of the magazine and was trying to think of some way to get the past ones reprinted possibly as paperbacks. He went on about settling a little bet with another G-8 fan as to whether there was ever a woman villain in any of the G-8 stories. 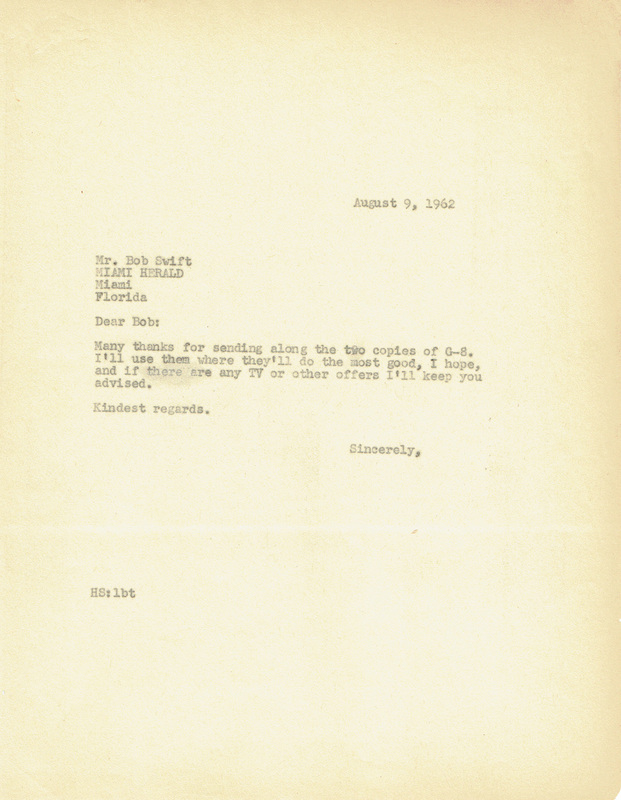 He ended the letter: “With many thanks again for everything you have done for us indirectly —-” There must be some smoke behind all these little signal fires, which might be to our advantage if handled correctly. You mentioned in your letter, Harry, that you had no sales set-up for a G-8 renaissance and suggested I try selling G-8 to one or several mediums. So far as adapting or scripting any of the old stories for TV or whatever, I’ve never done a script although my/stuff has sold to TV in GE and Loretta Young and to the movies, all of which was adapted in the studios, the only thing I might help out in, beside sales, would be in an advisory capacity. I’m also afraid any efforts to write new G-8 stories would lack the old zing of twenty or more years ago. Anyway, there were a hundred odd old stories, which the old readers have forgotten and, according to their many expressions of hope, would like to read over again in newly published paperback editions. Also new reader possibilities. I’ve thought of the autobiographical book I mentioned in my other letter (a backward look at the old pulp days with a G-8 novel added) as a possible build-up to a string of republished G-8 paperbacks, if we could sell the idea to any of the paperback publishers. This might eventually lead to the sale for TV. In any event, it Is a very long shot in the dark. 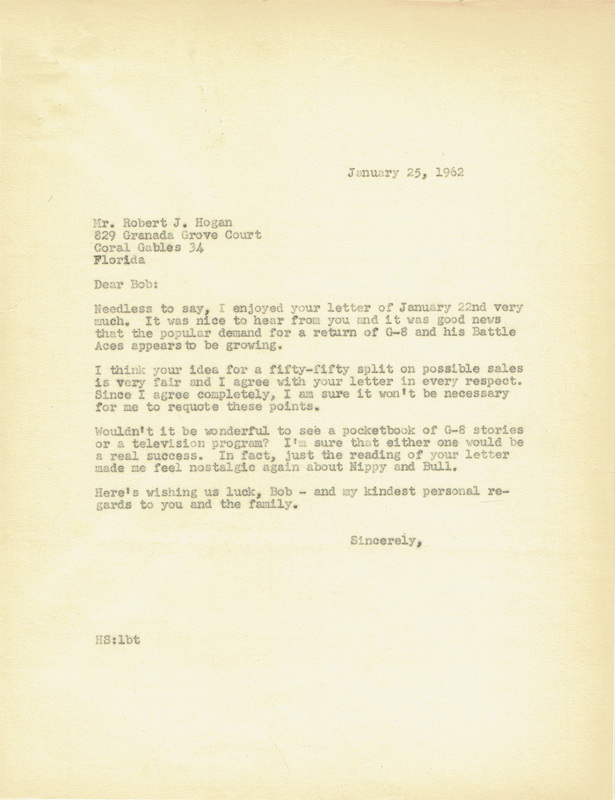 However, with all the furor the old readers have whipped up, particularly in the nation-wide organization known as “The Society of World War I Aero Historians,” which boasts a pretty impressive membership of successful young executives, including the advertising guys I mentioned, something might go. Betty’s father, Vic Lambdin, lives near us. He, my father-in-law, has been political cartoonist and newspaper man all his life (now retired). He says this thing busting out as a feature in the Miami Herald Sunday Magazine could very well bring what is needed to set off G-8 as a big thing. Turns out there are upwards of 5,000,000 readers of the Sunday Magazine down here at this time of year, with Florida loaded at the peak with what some laughingly call “the nation’s most important people.” Vic says they’re likely to burn up the Hogan phone with various offers or whatever. I don’t count on it, but it would be fun up to a point and, If so, it would be well to be prepared. With that in mind, it seems that maybe we should have some better idea of rights, mine and yours, in this thing. Here is the way I recollect the G-8 set-up as to ownership. I remember near the start you told me it was understood that the magazine was yours. As long as I wanted to and/or could write the G-8 stories, that was fine. 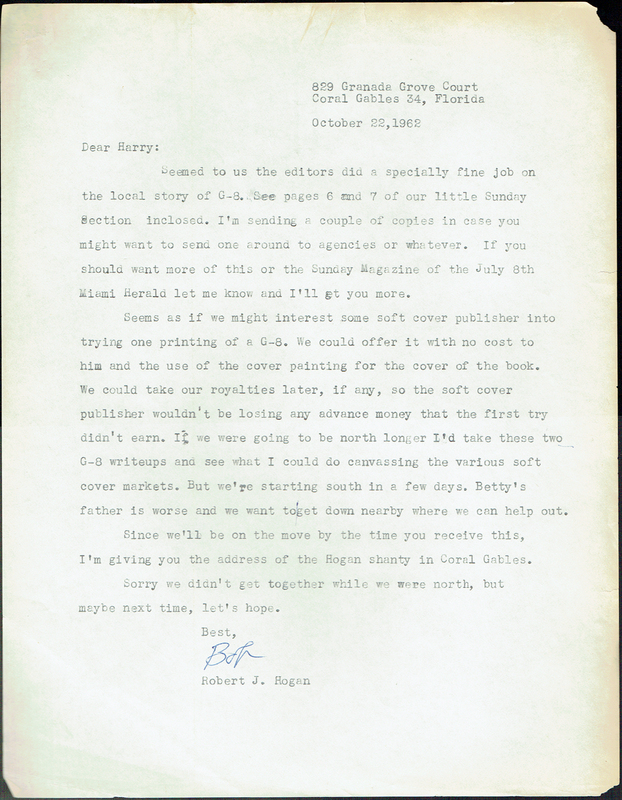 But if anything happened to me, you wanted Betty to understand that you would have to get someone else to write it under Robert J. Hogan. Of course we agreed. As to the rights to all stories I wrote for you, at first you purchased only first serial rights. 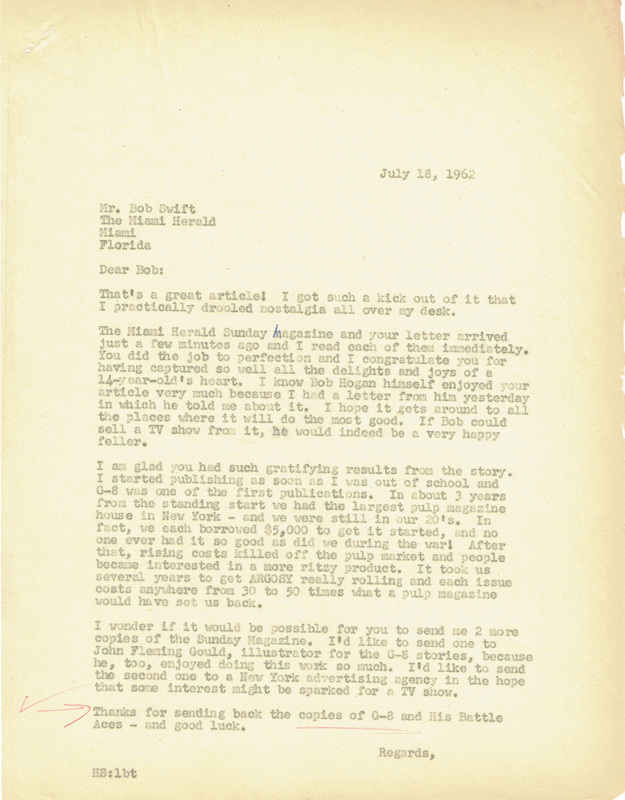 Then, because some writers were selling second serial rights to competing magazines, you bought all serial rights. At the time you explained this to me, you said that at any time I had legitimate sales for my writing to mediums other than competing magazines you would release the rights back to me. So, from the above, you own the magazine and I own the story rights. Now it seems to me with the bare possibility of something some day coming of this G-8 furor in paperbacks, TV, radio or whatever, there could be overlapping of rights and interests here and there. Also, we’ve always had the best relations with each other, Harry, and never a line of written contract. It seems to Betty and me that the best way to handle this, for all concerned and our joint good, would be on a fifty-fifty basis on all past G-8 stuff. If G-8 went into paperbacks I would like to write a forward for each, telling how that particular story came to be written and how I got the idea for that menace or war machine which seems to be the main part that the old readers still go nuts over. That would be part of our joint paperback sales, if any. In other words, whatever we could make out of old G-8 we would split the gross take, you and I, fifty-fifty. We might need an agent, but so far we have never needed one, and if contracts required a careful check, your Popular Publications attorney might take care of it. There probably isn’t a chance in the world that this G-8 comeback will amount to anything. However, some crazy things are happening these days. And wouldn’t it be fun to see the old boy diving in again with Nippy and Bull flying wing in Spads 13 and 7? 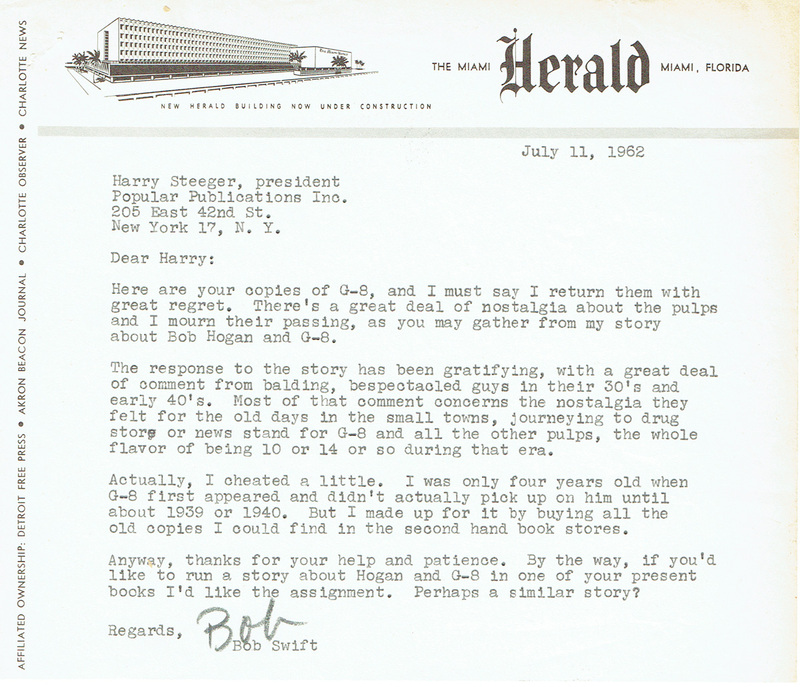 If this idea is agreeable with you—the feature story is due out in a week or two—would it be well for Bob Swift to mention in the article that the G-8 stories, series or whatever, are being submitted or negotiated for paperback and/or TV? How would you suggest wording it on the chance of raising some interest? Our best to you and yours, Harry. Needless to say, I enjoyed your letter of January 22nd very much. It was nice to hear from you and it was good news that the popular demand for a return of G-8 and his Battle Aces appears to be growing. 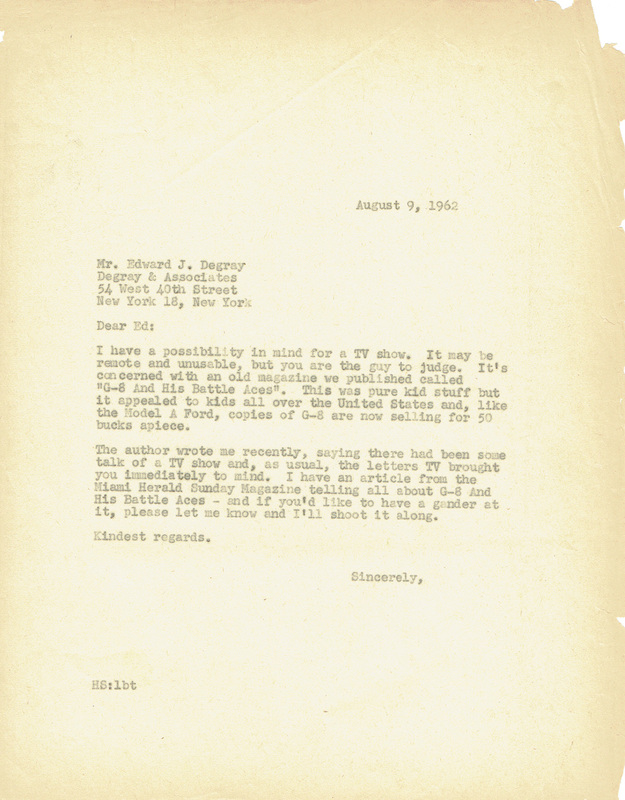 I think your idea for a fifty-fifty split on possible sales is very fair and I agree with your letter in every respect. Since I agree completely, I am sure it won’t be necessary for me to requote these points. Wouldn’t it be wonderful to see a pocketbook of G-8 stories or a television program? I’m sure that either one would be a real success. In fact, just the reading of your letter made me feel nostalgic again about Nippy and Bull. 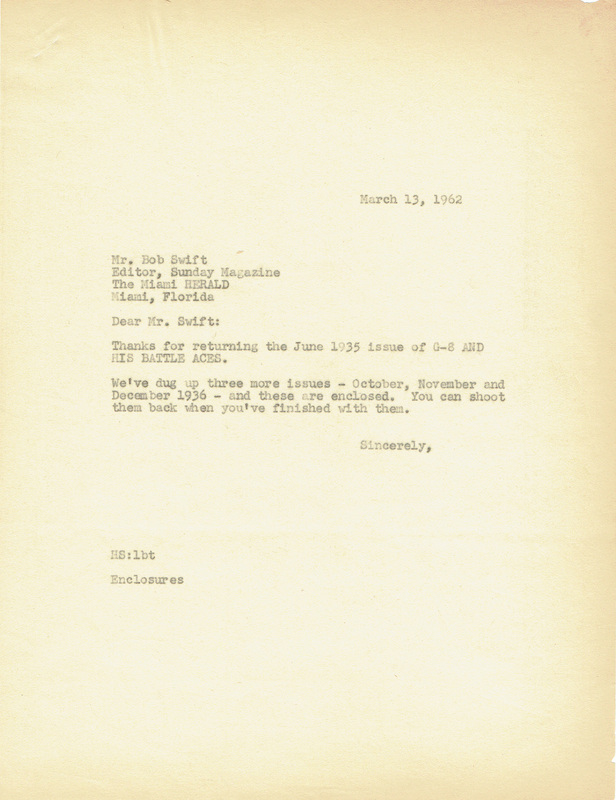 Here’s wishing us luck, Bob – and my kindest personal regards to you and the family. 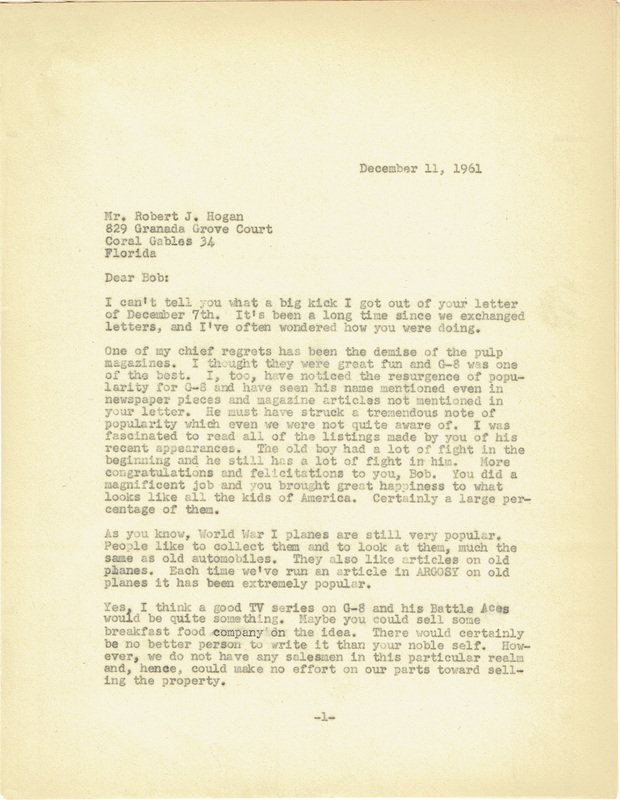 On December 7th, 1961, prompted by the growing nostagia over World War I and G-8 and his Battle Aces in particular, Robert J. Hogan took the time to write to his old publisher and friend Harry Steeger. . .
For some time I’ve been going to drop you a line on the matter of an old friend. Tempus fidgets and none of us is getting younger, except one old geezer who seems to be looming out of the past to haunt me, bless him. He, according to books, mailed reports, phone calls and magazines articles, seems to be growing younger and it does me good to think that I gave birth to this full sized adult who, defying the laws of Nature and Biology, seems to be gradually taking a second hold on life. Namely good old G-8 and His Battle Aces. I received my first inkle of this shot in the arm for the old boy perhaps three years, yes? over three years ago, when a guy phoned me long distance from somewhere to tell me how much he used to enjoy G-8 and to ask me if I had any copies of G-8 magazines I would care to part with. I said I had none for sale or loan but that I did love his flattery. He went on to say that he had been trying to buy some old back copies of G-8 and recently had been offered a brace of three, without covers, but assured that the first page of contents was there WITH THE AUTHOR’S NAME visible. The back number mag merchant would part with these three for the meager price of $7.00 for the three. He said he had asked what he might get one or more with covers and in good condition for and was told that if such a rare item could be found anywhere they would run from $10. each up and up and up. That was well over 3 years ago. A year ago Betty picked up a well written contemperary paper back novel wherein some guy was sounding off on “My country right or wrong,” after which he apologized by saying, “Damned if I don’t sound like G-8 and his Battle Aces.” Then continued a few sentences of dialogue something like, “Damned if you don’t look like G-8,” and “Wasn’t that the best damned set of character stories that ever hit print?” etc. etc. 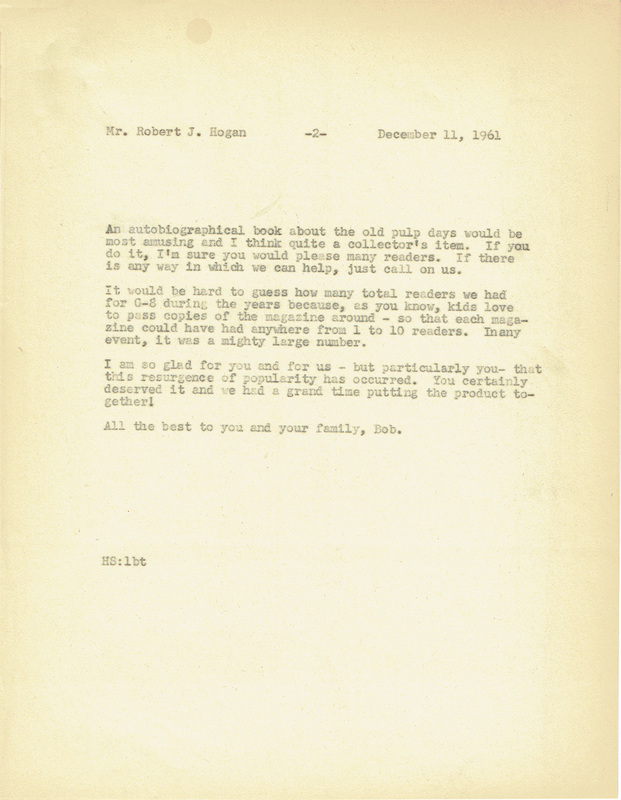 Next thing, one of the boys in the Sparta PO said someone had come through asking where the house of Robert J. Hogan was. Said he wanted to see where G-8 stories were written. This was nearly 15 years after publication was suspended. The upshot of all this is that he wants to run a piece on ye old creator and writer of G-8 and His Battle Aces. I told him I had nothing on G-8 down here with me. He said he would write you and ask if you might have an old proof sheet or something you could send him of one of the old cover prints. He wants to do a special in full color in the Sunday mag. No doubt you have heard from him by now. On top of that comes an article in SPORTS ILLUSTRATED? October 30th 1961 issue, by Robert H. Boyle, titled HELL’S OLD ANGELS. On page 61 on and on under the paragraph head THE FLYING SPY he does some nice stuff on old G-8 and says that Hollywood and other sources are now probing the possibilities of making TV series out of World War I stuff and—well you can read it. You’ll get a kick out of it, I know. Wouldn’t it be something if they saw a good TV series in G-8 and His Battle Aces? I know that if or when G-8 sells to TV or whatever interests, you’ll see to it that they make fitting payment to the guy who originated and wrote the series. Believe me, we can use it. For now, I’m writing about another angle of this new G-8 popularity. 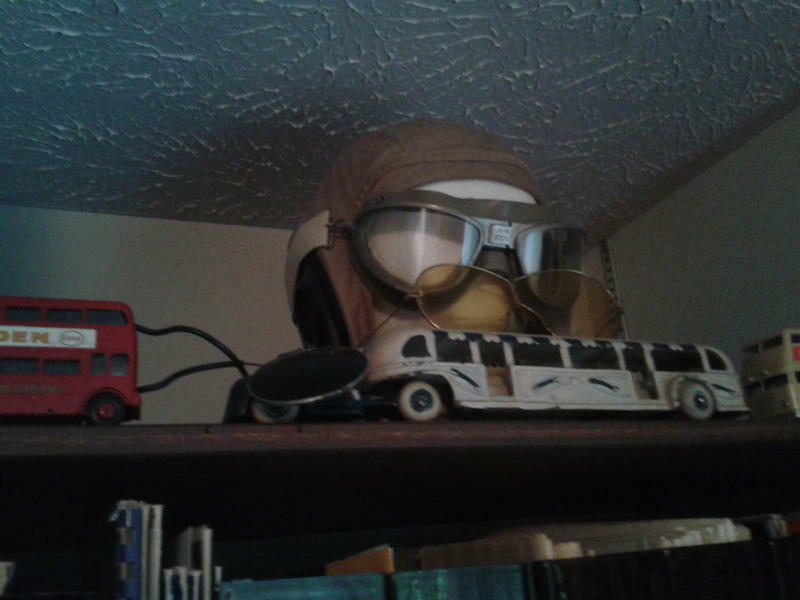 Because of this furor that seems to have been growing over G-8, bless his handsome heart and diary, I’m planning to do a sort of autobiographical book about the old pulp days as I knew them and the development of said G-8 and His Battle Aces and how they grew. So many amazing and Interesting things connected with the writing of the magazine and the pulps in general. Why and how come practically every owner of a seat on the NY stock exchange came to read G-8 and His Battle Aces, a magazine aimed at age 14 I believe you said, and never missed a copy during the 30s. 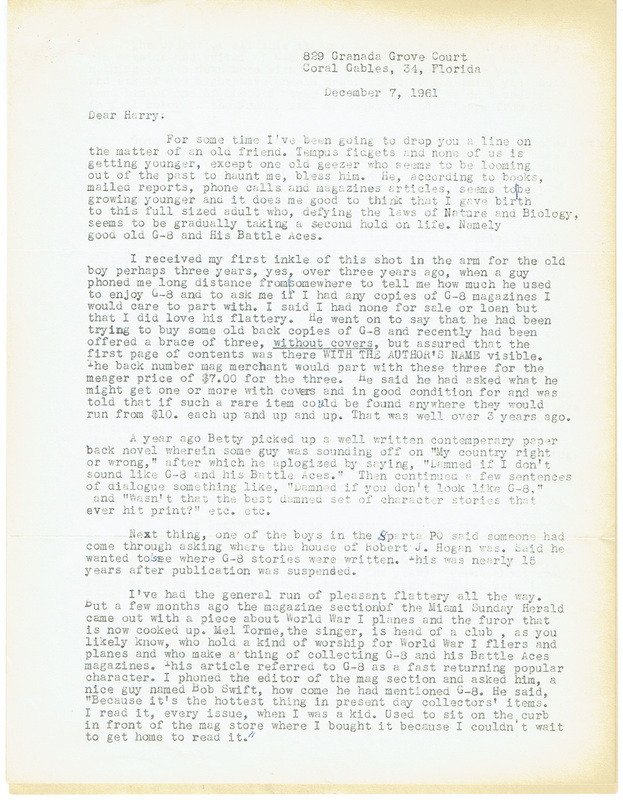 The fun we had writing for the pulps and the funny things that came up from the thousands of letters we received from fans all over the world. And I’m hoping I could have your permission (when I get the autobiog. part done) to publish one of the G-8 novels at the conclusion of the book, with illustrations, cover and all. At least some arrangement so any cost for such rights, if any, wouldn’t come out of me and my royalties. Best to Al Norton, Eva, Peg and any others of the old bunch who may still be about. And the best of the best to you, Harry. It’s beginning to look like we created an era that may live for some time in the memory of the old G-8 readers. How many total readers, would you guess, G-8 really had during the years? Seems about every young man I’ve ever talked to of that age range read the mag at some time. 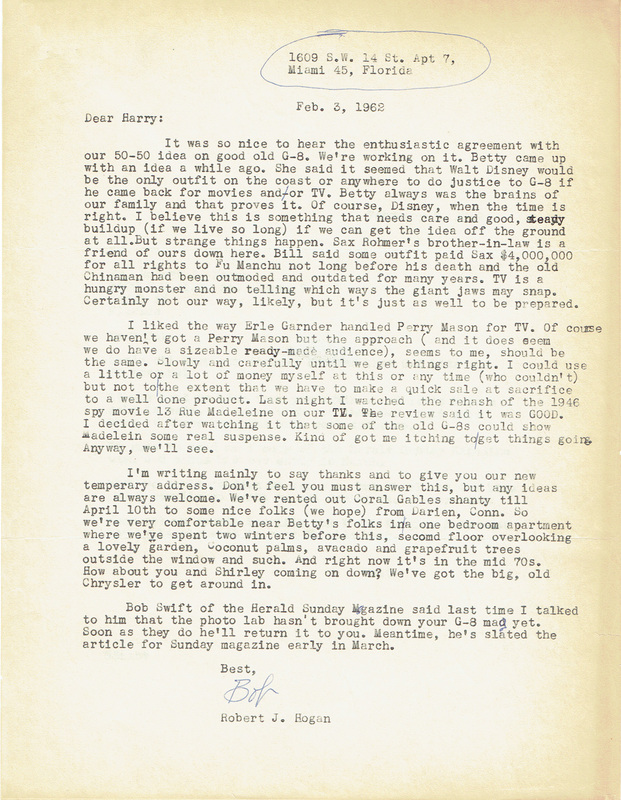 I can’t tell you what a big kick I got out of your letter of December 7th. It’s been a long time since we exchanged letters, and I’ve often wondered how you were doing. One of my chief regrets has been the demise of the pulp magazines. I thought they were great fun and G-8 was one of the best. I, too, have noticed the resurgence of popularity for G-8 and have seen his name mentioned even in newspaper pieces and magazine articles not mentioned in your letter. He must have struck a tremendous note of popularity which even we were not quite aware of. I was fascinated to read all of the listings made by you of his recent appearances. The old boy had a lot of fight in the beginning and he still has a lot of fight in him. More congratulations and felicitations to you, Bob. You did a magnificent job and you brought great happiness to what looks like all the kids of America. Certainly a large percentage of them. As you know, World War I planes are still very popular. People like to collect them and to look at them, much the same as old automobiles. They also like articles on old planes. Each time we’ve run an article in ARG0SY on old planes it has been extremely popular. Yes, I think a good TV series on G-8 and his Battle Aces would be quite some thing. Maybe you could sell some breakfast food company on the idea. There would certainly be no better person to write it than your noble self. However, we do not have any salesmen in this particular realm and, hence, could make no effort on our parts toward selling the property. An autobiographical book about the old pulp days would be most amuslng and I think quite a collector’s item. If you do it, I’m sure you would please many readers. If there is any way in which we can help, just call on us. It would be hard to guess how many total readers we had for G-8 during the years because, as you know, kids love to pass copies of the magazine around—so that each magazine could have had anywhere from 1 to 10 readers. In any event, it was a mighty large number. I am so glad for you and for us—but particularly you—that this resurgence of popularity has occurred. You certainly deserved it and we had a grand time putting the product together! All the best to you and your family, Bob.